So the time has nearly come to send out our September Outlaws boxes and we know that for a fact, because Book Box Club HQ is a city of boxes as all of the lovely books and box items wait to be lovingly packed. We can’t wait to send this next box out to you as it marks our very exciting first birthday! Woo hoo! 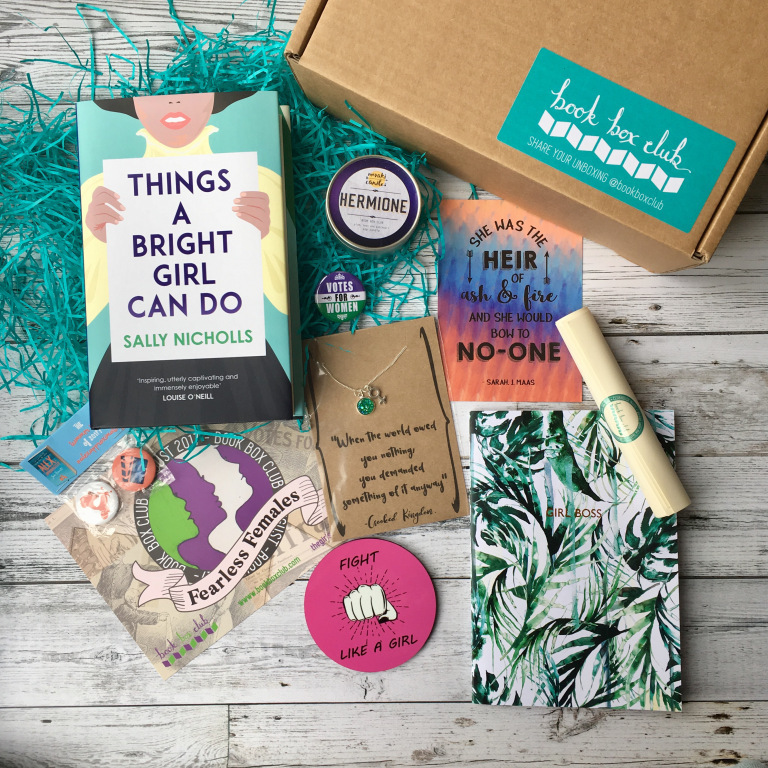 As we are in celebratory mood, we thought it was high time we shared with you all of the lovely items we included in our FEARLESS FEMALES August box. We LOVED putting together this box; we got really carried away with all the female empowerment and found ourselves shouting about women’s rights to anyone who would listen. Our August theme was one that was very close to our hearts. Being a total boss girl in the 21st Century is a tricky balancing act so we were thrilled to have the chance to celebrate female solidarity, strength, compassion and all round awesomeness! Hooray! THINGS A BRIGHT GIRL CAN DO BY SALLY NICHOLLS: Evelyn, May and Nell. Three inspiring young women thrust into the chaos of war, politics and the fight for equal rights. But under the crush of The Great War and the blaze of first love, what will it take for their ambitions to become unstuck? An unforgettable novel that will leave you punching the air in girl power solidarity! SCROLLED INVITATION TO THE CLUBHOUSE BOOK GROUP: Mingle with our other lovely unashamedly bookish members and quiz our featured author – Sally Nicholls – at our members-only online book group! HEIR OF FIRE MAGNET BY BOOK BOX CLUB: Fearless females don’t get much fiercer than Celaena Sardothien from Sarah J. Maas’ Throne of Glass series. Pledge your allegiance to this bookish heroine with our own exclusive magnet. BOOKISH GOODIES: With thanks to our friends at Simon & Schuster and Andersen Press. This month we were so excited to work with some amazing craftswomen and one fantastic man (because men can be feminists too!). We’d like to say a big thank you to everyone who helped make this box FEARLESS, you guys rule! As always we’d also like to say a huge thank you to all of our lovely members who have shared their August unboxings with us, we love seeing your beautiful photos, watching your unboxing videos and reading all the lovely things you write in your blogs; we really do get so excited every time we get tagged on social media!